Duvivier received his initial training in Bruges and then moved to Paris, where he assimilated the severe Neoclassical style perfected by Jacques-Louis David. In this early work, Duvivier combined the poses of several antique statues to illustrate an episode recounted in Plutarch's "Life of Mark Anthony." 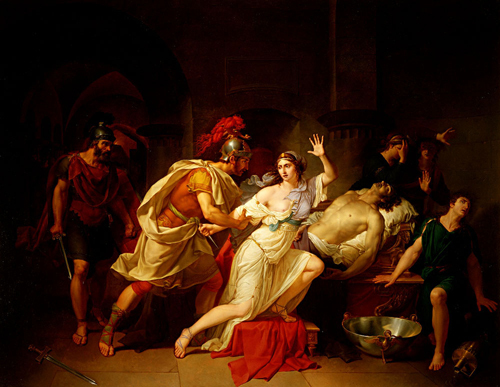 Following Anthony's suicide, a Roman soldier attempts to forestall the Egyptian queen's own death by promising that Octavian Caesar will show her clemency. The subtle, glowing colors, precise attention to detail, and impeccable draughtsmanship presage the artist's occasional work as a miniaturist.